Paula Salas, El Barrio del Molino, MAVI Santiago. November 2014. 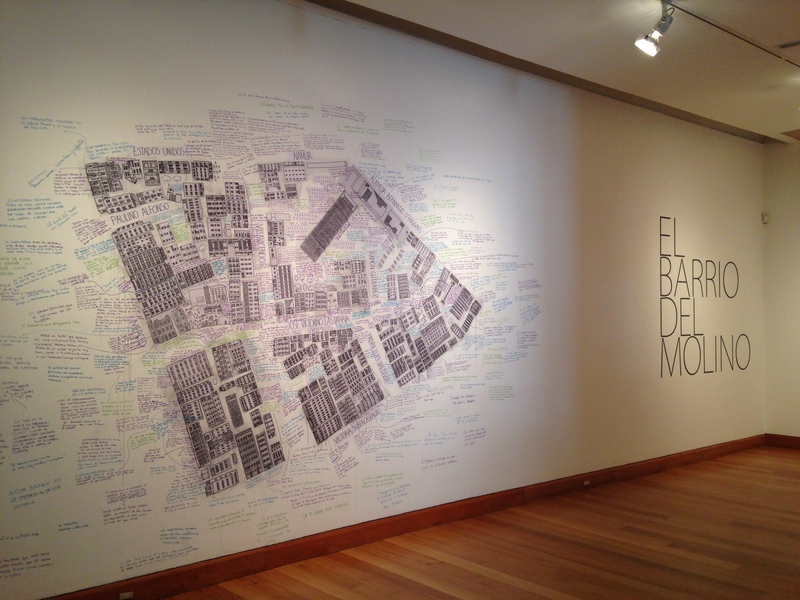 The Museo de Artes Visuales (MAVI) in Santiago is currently exhibiting “El Barrio del Molino,” a research + installation project by the Chilean artist Paula Salas. The barrio in question is Barrio Lastarria, a neighborhood that is hands down the best place in Santiago to spend a weekend. The installation is fairly small, occupying barely three walls of the first gallery space you encounter after entering the MAVI. 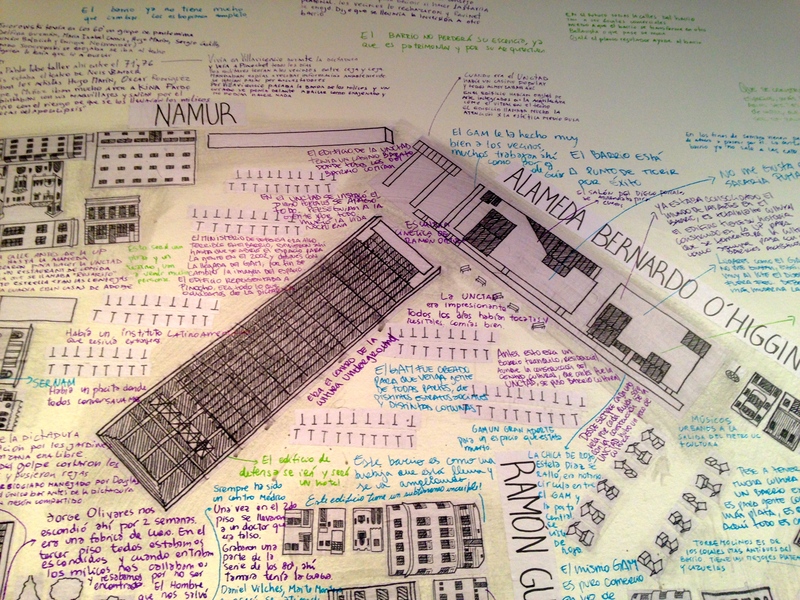 For me the star of the entire show was the main wall, which featured a map of the neighborhood, colored with gossip. I should note that Barrio Lastarria is going through a tremendous facelift at the moment in the form of new restaurants and boutique hotels. Naturally this evolution has generated strong feelings among the locals, which is precisely what Salas sought to document. The artist interviewed these personages in order to assemble the anecdotal-map on the main wall. Paula Salas, wall detail, El Barrio del Molino, MAVI Santiago. November 2014. >When it was [still] the UNCTAD, there was a popular cafeteria and everyone ate lunch there. In the building, there were art objects integrated into the architecture, like the stained-glass windows in the ceiling. The building attracted a lot of attention because the aesthetic was somewhat Russian. >The UNCTAD [conference] was amazing. There were jam sessions and recitals. One ate well. >The GAM was created so that people from every place, from distinct social strata, and different neighborhoods could gather. >This used to be a quiet, residential neighborhood. Though with the construction of the cultural center, which used to be the UNCTAD, the neighborhood is more cultural now. >GAM is a great support for a space that was dead. >The GAM has been very good to the residents because lots of them work there, for example as guides. >The neighborhood is on the point of death due to the success [of the GAM]. >The Diego Portales salón could be rented out for events. >Diego Portales replaced the UNCTAD [in name] and everything switched off. They persecuted people for any reason. Nightlife died. >The Ministry of Defense was something terrible in the neighborhood, they were there until the space was opened for people in 2002, and later with the arrival of the GAM, and finally the image of the space changed. The building represented Pinocho [derogatory slang for Pinochet], it was everything we hated about the dictatorship.